The second blog in this series focuses on museums and galleries in the United Arab Emirates. This blog post was inspired by Past Forward: Contemporary Art from the Emirates – the first major touring exhibition of Emirati artwork abroad. The exhibition showcases core elements of life in the UAE, further informing American audiences of Emirati art, history, and tradition. Our previous post featured art events in the UAE. This post highlights a number of museums and galleries that play a vital role in shaping and advancing the arts and culture in the UAE. While some museums are still in their construction phase, many would agree that these bold projects place the country on the global art map. Zayed National Museum is a place for all; for UAE nationals, residents, and visitors, for lifelong visitors to the world’s great cultural institutions, and for those making their first-ever museum visit. Sheikh Zayed was renowned for the warmth he extended to people from all walks of life, and this spirit continues in the institution that bears his name. 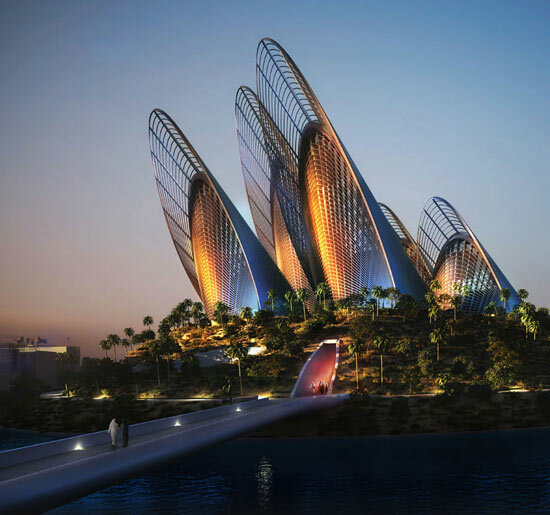 The Zayed National Museum will have seven permanent gallery displays, as well as a dynamic special exhibition program in which visitors can explore the long history, heritage, and culture of the UAE and its place in the world. Each gallery is inspired by the values of Sheikh Zayed: his belief in education, conservation, heritage, and culture, all underpinned by his humanitarianism. This museum is due to be completed in 2016. The building is designed to minimize energy usage by incorporating natural ventilation and lighting in the five towers, and will have photovoltaic panels and heat exchange technologies/Courtesy of Saadiyat Cultural District. 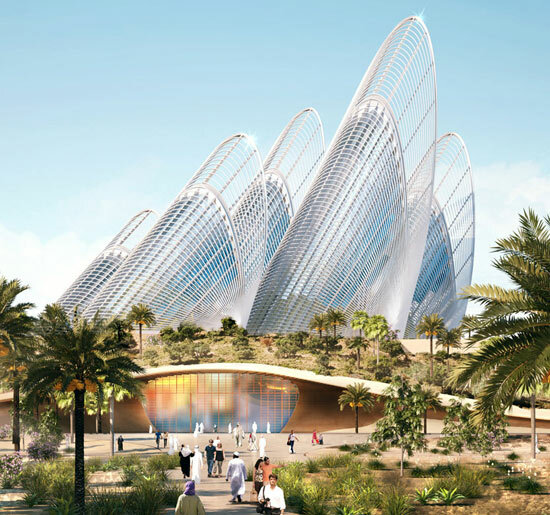 Zayed National Museum will be surrounded by a beautiful garden where landscaping and installations will explore key moments in the life of Sheikh Zayed and his transformation of the UAE/Courtesy of Saadiyat Cultural District. 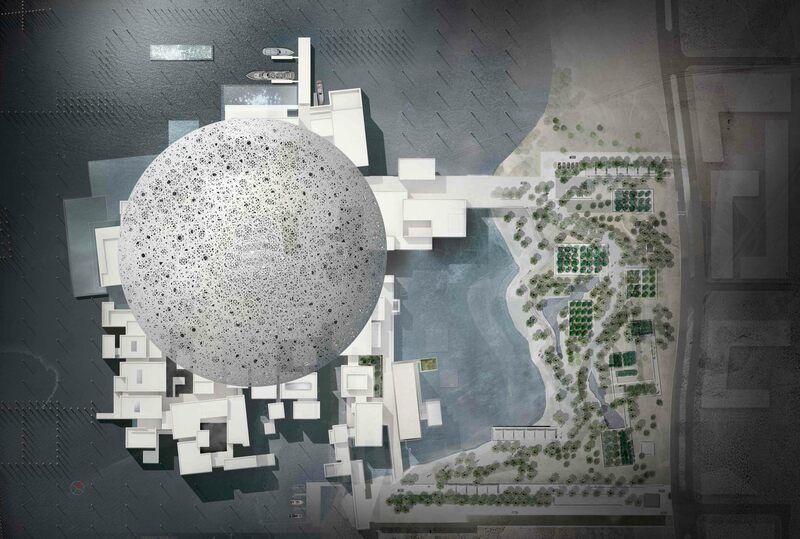 The future Louvre Abu Dhabi will be a universal museum in the Arab world. Its very name is a testament to an unprecedented alliance between the United Arab Emirates and France, through one of the highest levels of cultural cooperation ever created between two sovereign countries. This project establishes a long and solid relationship between the renowned Musée du Louvre in Paris and Abu Dhabi, which is a dynamic force in the contemporary world. Rendering of an aerial view of the Louvre Abu Dhabi/Courtesy of the Luxury Elitist. 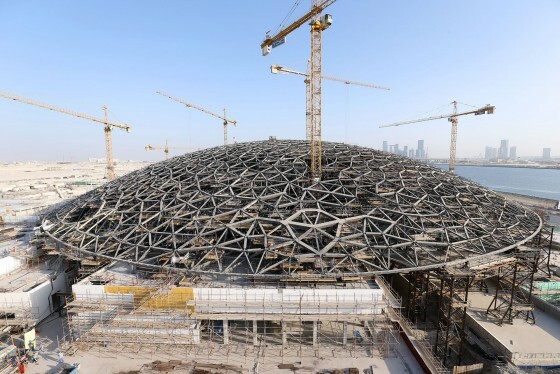 Aerial view of the completed dome structure at the Louvre Abu Dhabi in October 2014/Courtesy of Big Project ME. Another world-famous museum, the Guggenheim, will be adding a new location in Abu Dhabi. 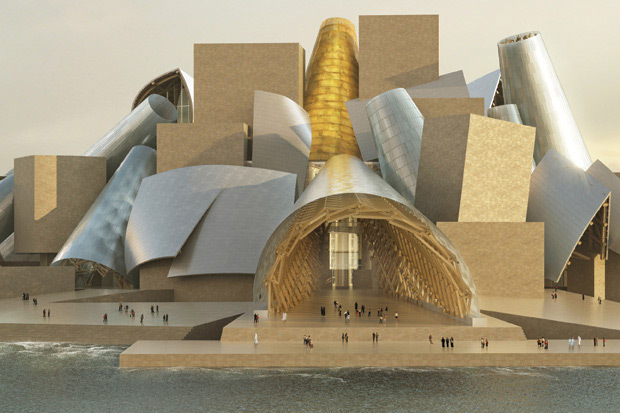 Guggenheim Abu Dhabi will move beyond a definition of global art premised on geography by focusing on the interconnected dynamics of local, regional, and international art centers as well as their diverse historical contexts and sources of creative inspiration. In realizing this endeavor, the museum will acknowledge and celebrate the specific identity derived from the cultural traditions of Abu Dhabi and the United Arab Emirates, as well as with other countries comprising the Middle East, even as it pioneers a novel, visionary model that will redefine the art-historical canon. Designed by American architect Frank Gehry, Guggenheim Abu Dhabi’s cones recall the region’s ancient wind towers, which both ventilate and shade the museum’s exterior courtyards in a fitting blend of Arabian tradition and modern design/Courtesy of Frank Gehry and ArteFactoryLab. 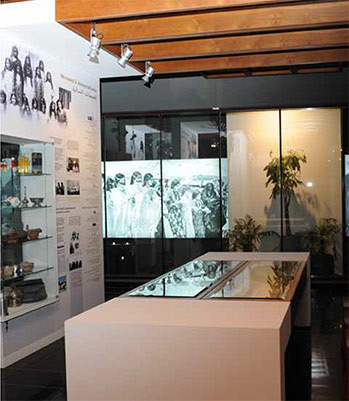 The Women’s Museum is a national archive and documentation center, dedicated to the Emirati women. It is concerned with all aspects of women’s lives in the UAE and their historical and social contexts, which have shaped their philosophy, their status in society, and their place in the family. As a contemporary cultural center, the museum explores the activities of Emirati women in the arts, academia, business, culture, politics, and society in general. The Women’s Museum aims to acquaint visitors to the UAE with the various aspects of the daily lives of Emirati women. H.H. Sheikh Majed bin Mohammed bin Rashid Al Maktoum visits the Women’s Museum, where Shaikha Al Mazrou, a Past Forward artist, discusses her work/Courtesy of Women’s Museum. One of the museum’s current exhibitions/Courtesy of Women’s Museum. Established in January 2008, Tashkeel is an independent resource for artists and designers living and working in the United Arab Emirates. Tashkeel is committed to facilitating art and design, cross-cultural dialogue, and creative exchange. Members have access to its facilities, which include studios in fine art, photography, printmaking, textile printing, MAC suite, jewelry, and sculpture. 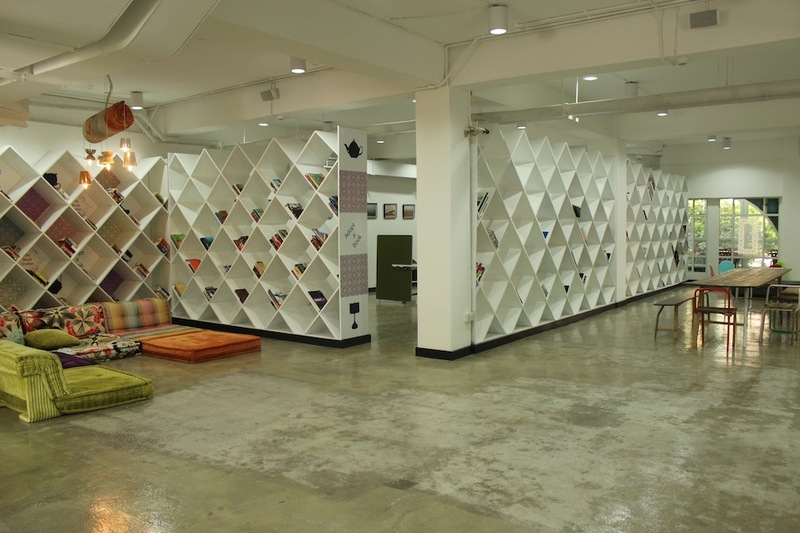 In addition to the studio resources, Tashkeel provides a reference library, as well as a member’s room and a gallery that is open to the public. Tashkeel also organizes workshops in creative practice, which are open to both members and non-members. The Nad Al Sheba Gallery in Dubai/Courtesy of Tashkeel. The exhibition As the Saying Goes (2011), which showcased artworks inspired by Emirati proverbs/Courtesy of Tashkeel. A skateboarding ramp made in the shape of the Arabic word tashkeel/Courtesy of Afar. 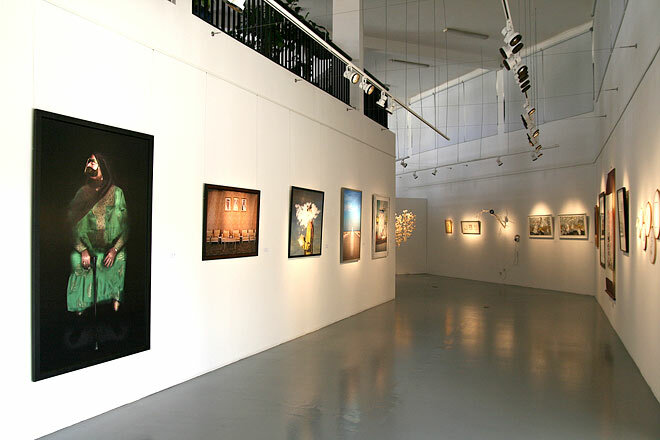 Founded in 2008, Cuadro Fine Art Gallery, located in the Dubai International Financial Center (DIFC), has quickly become one of the UAE’s premier contemporary and modern art venues. Each year, Cuadro assembles a substantial curatorial program in four distinct visual areas of interest: painting, paper, photography, and sculpture. Each exhibition centers on a significant educational paradigm that is accompanied by lectures, workshops, and panel discussions. In addition, Cuadro provides qualified art consultation services for its discerning collectors, offers an international platform for its stable of artists, and administers an extensive Residency Program for a select group of artists. 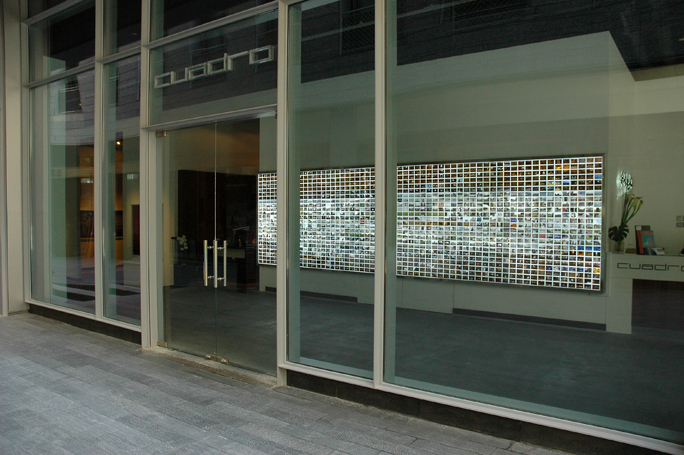 Roberto Lopardo created a digital photography light box installation titled Mapping Dubai/Courtesy of Cuadro Gallery. Founded in March 2011, Lawrie Shabibi is a contemporary art gallery located on Dubai’s Alserkal Avenue in the Al Quoz industrial district. The gallery promotes the works of relevant and innovative contemporary artists from the Middle East, North Africa, and South Asia. The program’s focus is on supporting established and emerging contemporary artistic talent. Shaikha Al Mazrou, who has two artworks in Past Forward, recently joined Lawrie Shabibi. 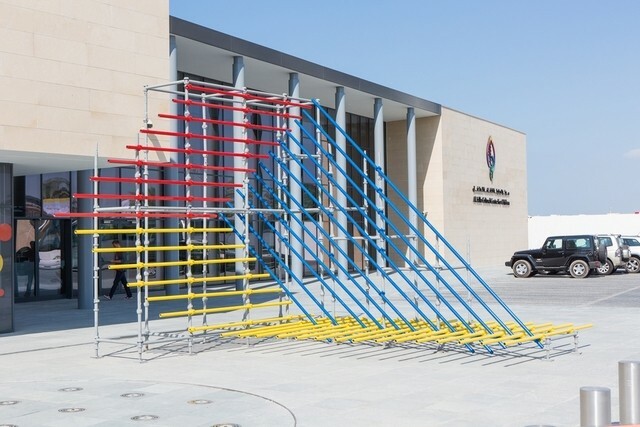 Stand Here, a public sculpture by artist Shaikha Al Mazrou/Courtesy of Lawrie Shabibi and Shaikha Al Mazrou. XVA is one of the leading galleries in the Middle East that specializes in contemporary art from the Arab world, Iran, Pakistan, and other neighboring countries. Exhibitions showcase artworks by the region’s foremost artists, as well as those emerging onto the scene. XVA Gallery exhibits both locally and internationally, and participates in international art fairs, such as Art London, SH Contemporary, and Art Basel Hong Kong, in order to further expose Middle Eastern contemporary art. XVA boasts a unique art hotel, an award-winning vegetarian café, several shops, an in-house tailor, and a traditional dhow (sailing vessel). 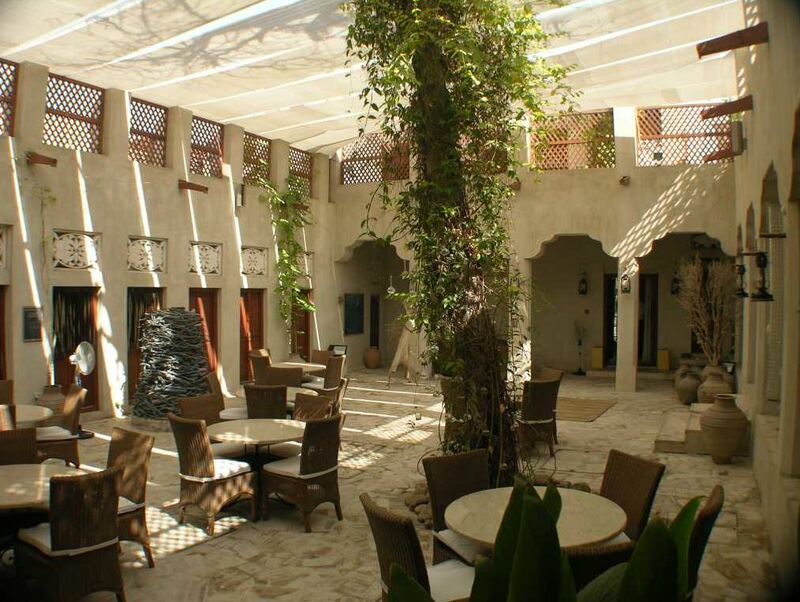 XVA Gallery and XVA Art Hotel are located in Dubai’s heritage district, now called Al Fahidi Neighborhood. A traditional home in Bastakiya was restored to house an art gallery, café, and guesthouse. Houses in Dubai were traditionally built around a central courtyard, which was considered the heart of the home/Courtesy of Mountain Soft Travel Photos. 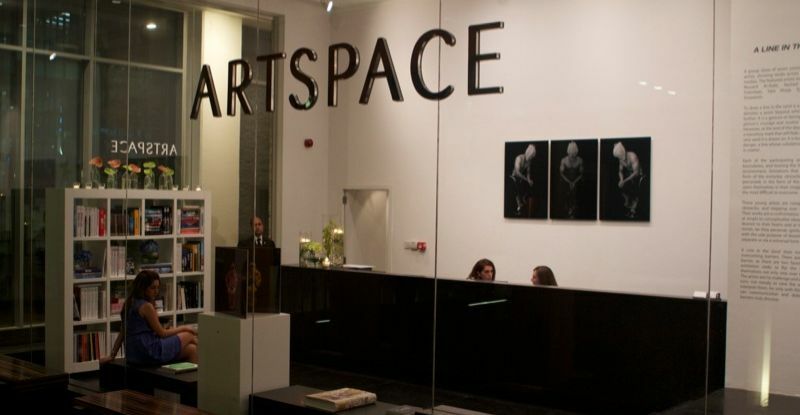 Artspace Gallery caters to the tastes and trends of the sophisticated Dubai art market and the gallery’s discerning worldwide collector base. The gallery’s diverse clientele includes private collectors, art consultants, corporate art consultants, architects, and interior designers, as well as leaders in the corporate, government, diplomatic, and social sectors. Artspace at the Dubai International Financial Center, where many art gallaries have taken root/Courtesy of Marcoma Villa. 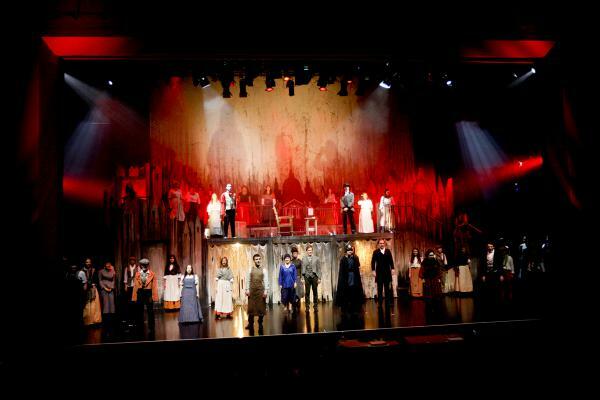 Dubai Community Theatre & Arts Centre (DUCTAC) contributes to the creative and cultural development of Dubai by presenting and hosting events and participatory activities for Dubai’s multi-national communities and visitors. The Theatre & Arts Centre is the first modern, non-profit, cross-community creative center in the Gulf. This flagship project was the brainchild of local theatre-lovers, arts enthusiasts, artists, and business people who recognized the need for an entertainment and educational center in Dubai. Popular shows such as The Sleeping Beauty, Tripudium Latin Dance Show, Fantasia, and Hamlet – The Clown Prince have been performed in this theater/Courtesy of Digital Production ME & Ahlan Live. KASA is home to the KHALID SHAFAR brand – a space where all KHALID SHAFAR designs are permanently on display. KASA, which opened in late 2012, reflects founder Khalid Shafar’s ambition to create a reference point or touchstone for UAE design. KASA showcases original Emirati objects, all made in the UAE. 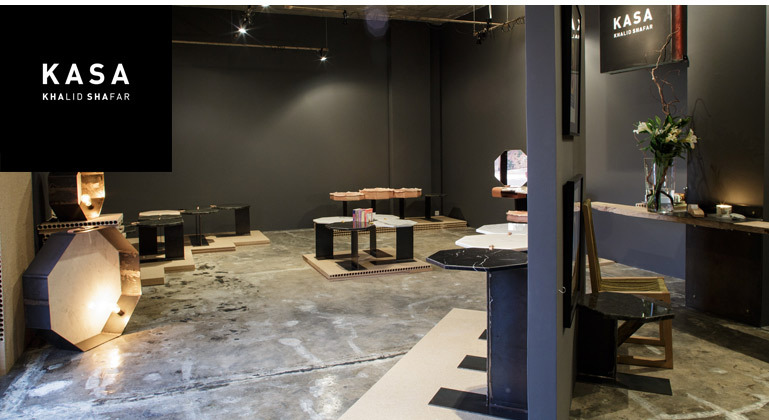 The space offers designers, collectors, and researchers – both national and international – a unique perspective of the aesthetics of UAE design, while shedding light on the influences of local crafts. Khalid Shafar’s KASA showroom in Dubai/Courtesy of KASA. Hind Mezaina, sister of Past Forward artist Khalid Mezaina, runs The Culturist, and her aim is to feature all things cultural in Dubai. Mezaina is passionate about movies, photography, lomography, music, travel, and cuisine, and has gathered a large online following. Her blog won Best Blogger Award in the second du Social Media Awards and won Best Asian Weblog in this year’s Bloggies. The Culturist was also selected as an Official Honoree of the 16th Annual Webby Awards in the Blog – Cultural category. 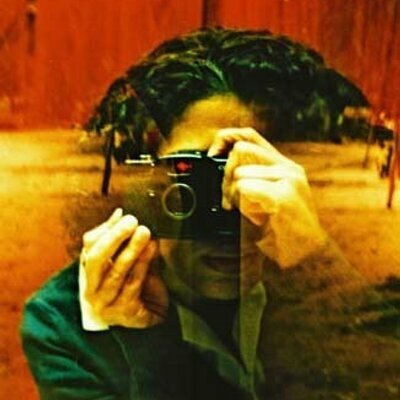 Self-portrait (lomography) by Hind Mezaina/Courtesy of Hind Mezaina. The Sharjah Art Foundation (SAF) brings a broad range of contemporary art and cultural programs to Sharjah, the UAE, and the region. Since 2009, SAF has built on the history of cultural collaboration and exchange that began with the first Sharjah Biennial in 1993. SAF works with international partners to create opportunities for artists through their core initiatives that include the Sharjah Biennial, the annual March Meeting, residencies, production grants, commissions, exhibitions, research, publications, and a growing collection. The foundation’s education and public programs focus on building recognition of the central role art can play in the life of a community by promoting public learning and a participatory approach to art. Sharjah Art Foundation is funded by the Department of Culture and Information, Government of Sharjah. 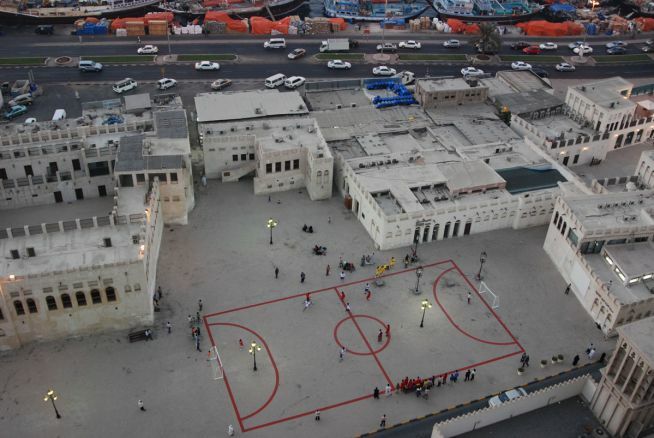 Maider Lopez creates Football Field as a commissioned work for Sharjah Biennial 2007/Courtesy of Alfredo Rubio. The Sharjah Museums Department (SMD) was established in 2006 by H. H. Dr. Sheikh Sultan bin Mohammed Al Qasimi, Supreme Council Member and Ruler of Sharjah, as an independent government department. SMD includes 16 museums covering Islamic art and culture, archaeology, heritage, science, marine life, and the history of Sharjah and the region. The purpose of SMD is to deliver the highest quality of museum services for Sharjah residents and visitors through its facilities, exhibitions, research, and community outreach. SMD aims to achieve an understanding, appreciation, and respect for Sharjah’s identity and for the value of its cultural and natural heritage. 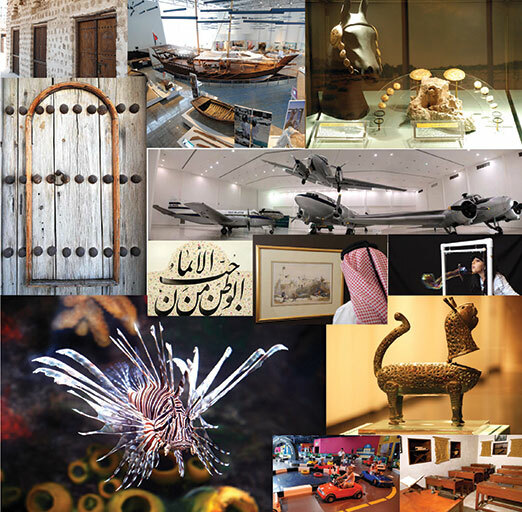 Snapshots of Sharjah museums that cover Islamic art and culture, archaeology, heritage, science, marine life, and the history of Sharjah and the region/Courtesy of Sharjah Museums Department. Sharjah Art Museum is the largest art museum in the Gulf with both temporary exhibitions and permanent collections by renowned artists. The museum explores the history of the region through the Orientalist painters of the 18th and 19th centuries, as well as gallery after gallery of stunning landscapes, cityscapes, and portraits created by both locally and internationally renowned artists. Three floors of galleries are dedicated to modern creative expression focusing on exhibitions and collections of over 300 works of art. 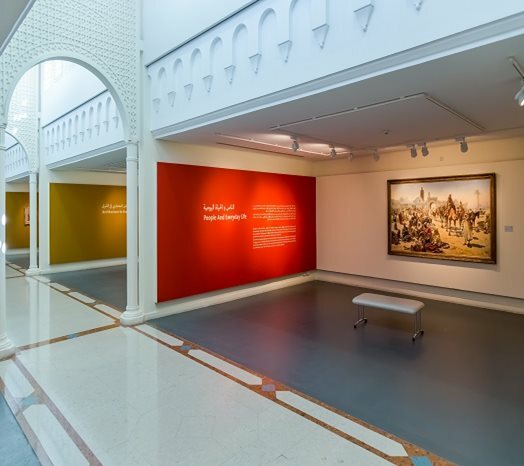 Gallery space dedicated to the museum’s orientalist paintings/Courtesy of Sharjah Museums Department. FUNN: Sharjah Media Arts for Youth and Children is an organization established by the Sharjah government. Under the patronage of H.H. Sheikha Jawaher Al Qasimi, wife of H.H. Sheikh Dr. Sultan bin Mohammed Al Qasimi of Sharjah, FUNN promotes and supports media art such as animation, film making, graphic design, and photography for children and youth. 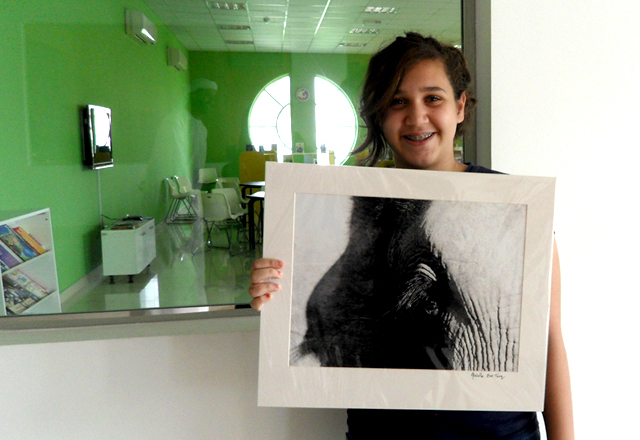 A FUNN participant creates a charcoal drawing during an art workshop dedicated to children/Courtesy of FUNN. The Maraya Art Centre is a non-profit art space and cultural platform located in Al Qasba. Supported by the Shurooq Investment and Development Authority, it promotes young artists from the Arab region and from the international art scene. Originally opened as the Maraya Art Gallery in 2006, it re-launched as the Maraya Art Centre in 2010 to meet the community’s growing demand for a public arts and works space. The centre is now one of the UAE’s most spectacular venues for contemporary visual arts. Maraya can be used for any number of design purposes, and is comfortably fitted with all the amenities you would expect in a world-class gallery. Visitors are invited to attend lectures led by featured artists, enroll in specialized workshops for students, teens and adults, and enjoy daily tours of the center’s three main levels. First level of the facility that houses the Maraya community space/Courtesy of Maraya. H.H. Sheikh Sultan Sooud Al Qassemi with his collection at the Maraya Art Centre in Al Qasba/Courtesy of Jeffrey E Biteng, The National. The National Museum of Ras Al Khaimah served as the residence of the ruling Quwasim family until 1964, when the late Ruler, H.H. 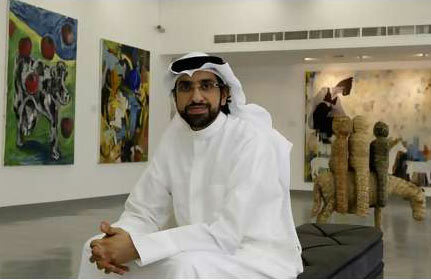 Sheikh Saqr bin Mohammed al-Qasimi, moved to a modern building in Mamoura. It later became a police headquarters and a prison, before being converted into the National Museum in 1987. Reflecting its eventful history, the National Museum has been continuously enlarged over time, displaying a rich diversity of traditional architecture. Today, the ‘Late Fort’ exhibits historical, ethnographical, and archaeological material relating to the emirate of Ras Al Khaimah and provides an interesting insight into the history and traditions of this area. Like all other traditional houses in Ras Al Khaimah’s Old Town, the ‘Late Fort’ was originally constructed from coral/Courtesy of the National Museum of Ras Al Khaimah. 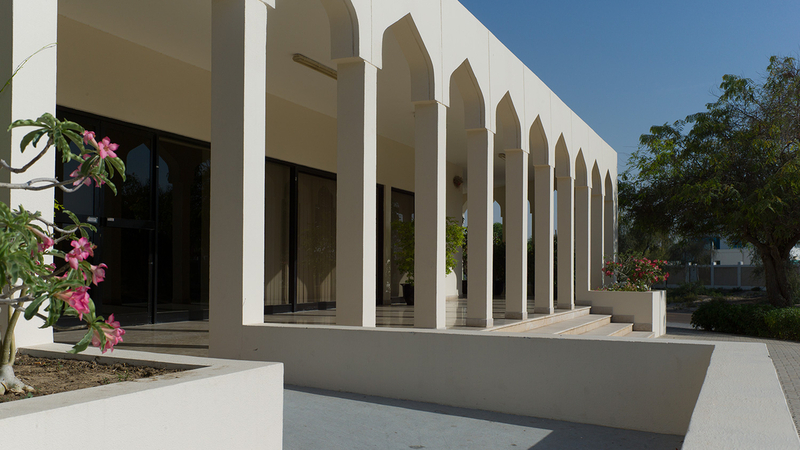 The museum showcases a variety of archaeological finds, presents historical information, and aspects of the cultural heritage of this emirate/Courtesy of the National Museum of Ras Al Khaimah. POST TAGS: Art, Arts, Cultural Diplomacy, Past Forward, UAE.